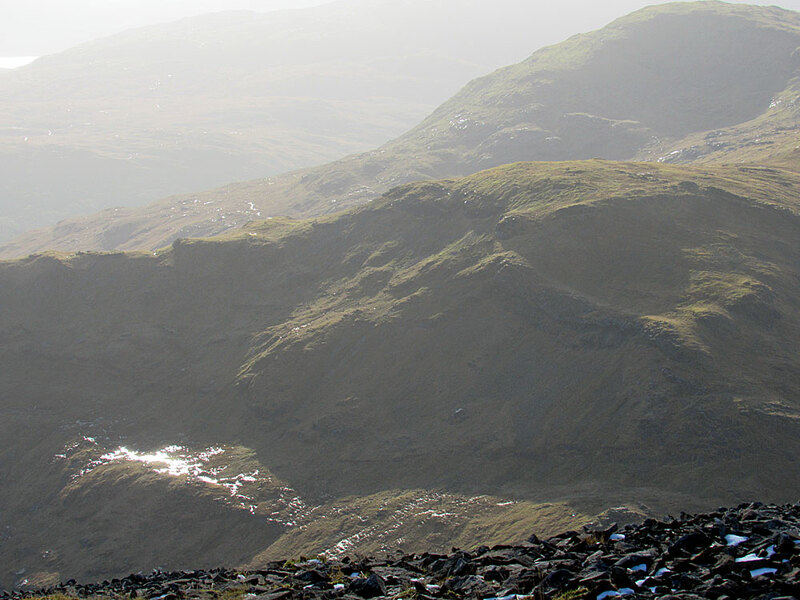 Even after the Munro List's latest promotions and demotions, I reckon I've now climbed around ninety-percent of Scotland's 3,000ft hills, many of them more than once. I lost the 'bagging bug' years ago, preferring now to concentrate on photography and wildlife rather than aiming to knock-off another tick but it's always nice to visit a new top. 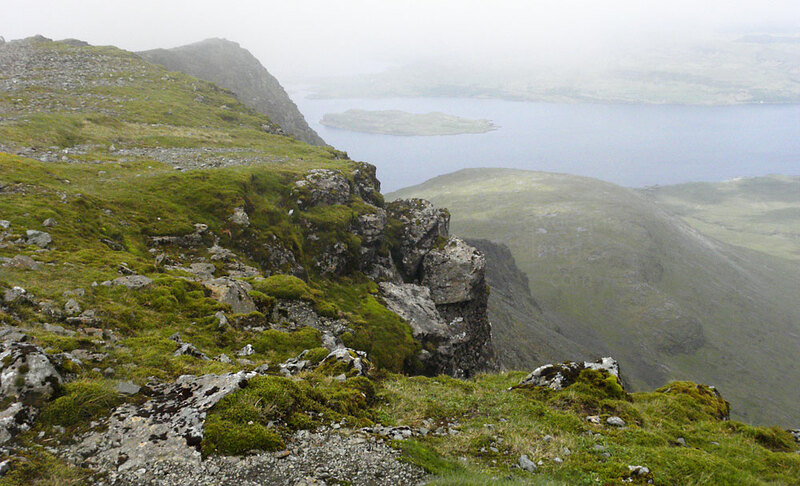 Atrocious weather prevented an ascent of Mull's highest mountain last time I was on the island so I took the chance when the forecast, although cloudy, was to stay dry. 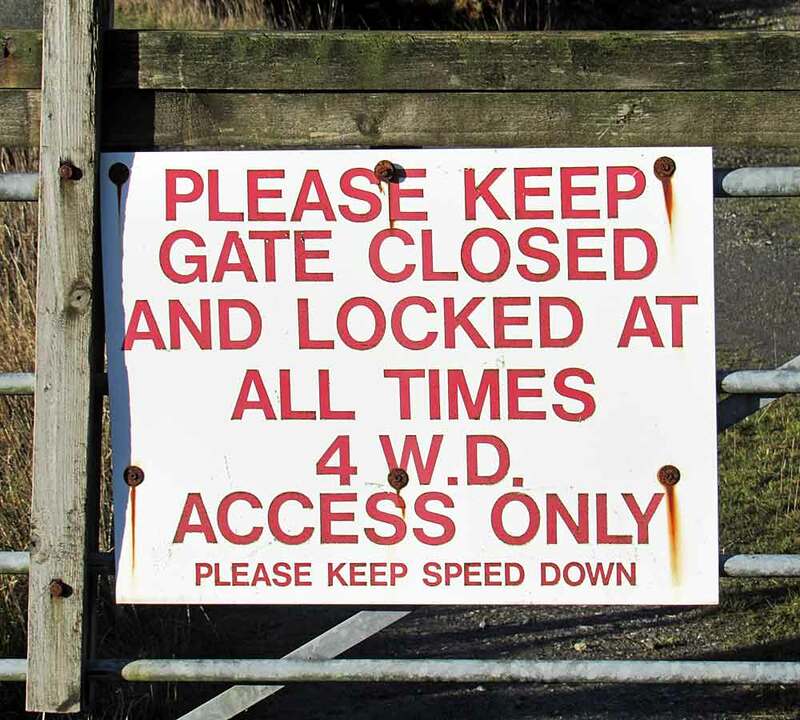 I made an early start but things didn`t look too promising on the drive round to the parking area. 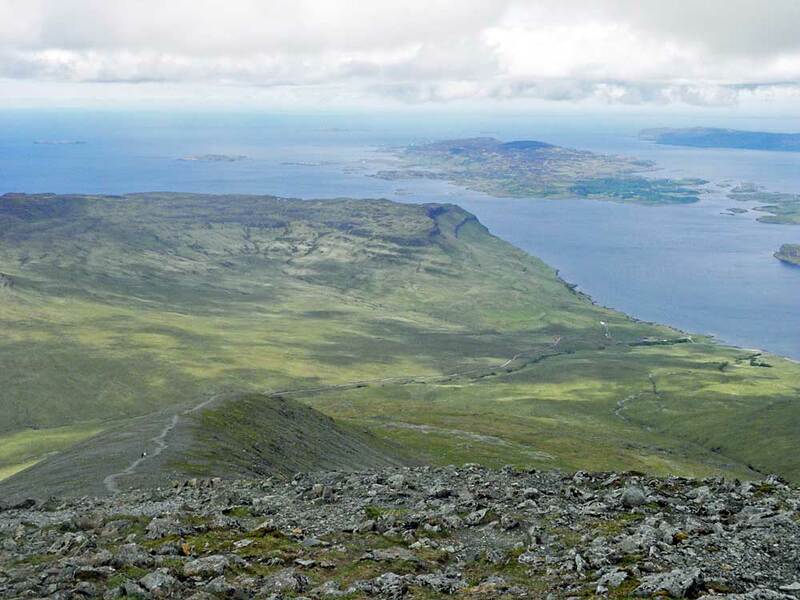 There are two main routes to the summit, both from the south shore of Loch na Keal. 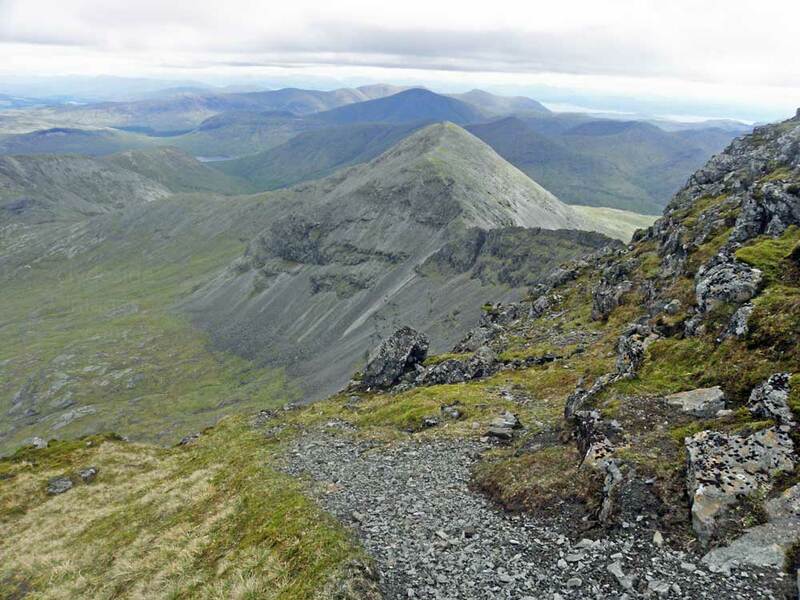 ​The first, beside the track to Dhiseig cottage, entails a straightforward plod from the parking area while the other, a circuit taking in Beinn Fhada and the A' Chioch Ridge, is far more dramatic with a mountaineering atmosphere. Sad to say, with no guarantee of a view, I opted for the former! 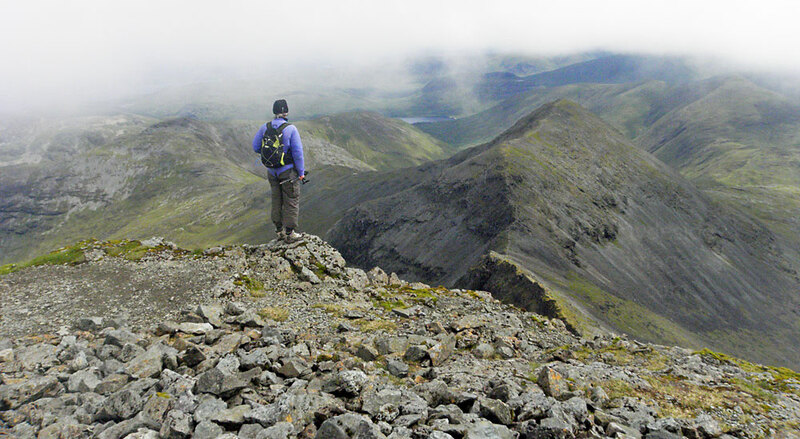 ​I had the summit of Scotland's most westerly Munro to myself for around 15 minutes before the next walker appeared. 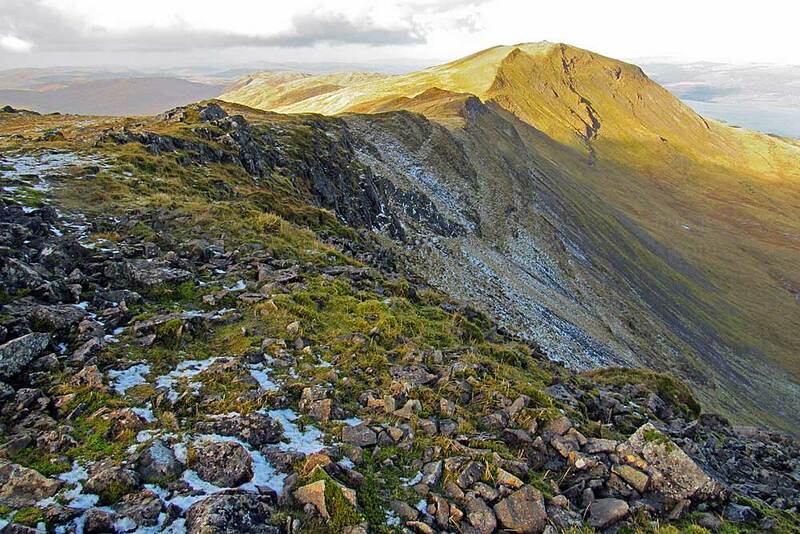 He didn't stay long and headed down to traverse the A' Chioch Ridge on the way back. I sat at the cairn for a while, finishing off my `piece`, while watching his progress. I photographed him at various points along the ridge to give a sense of scale but he`s very hard to make out in these small low-res shots. On the way down I passed the first few pairs of walkers heading up including a young couple from Singapore! 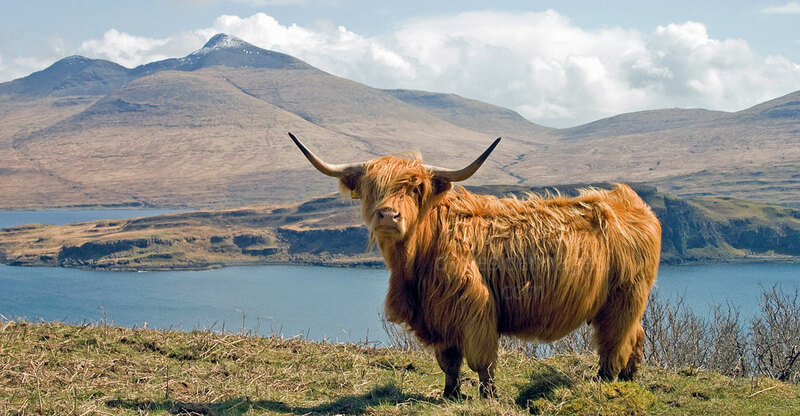 Mull really is a worldwide destination! 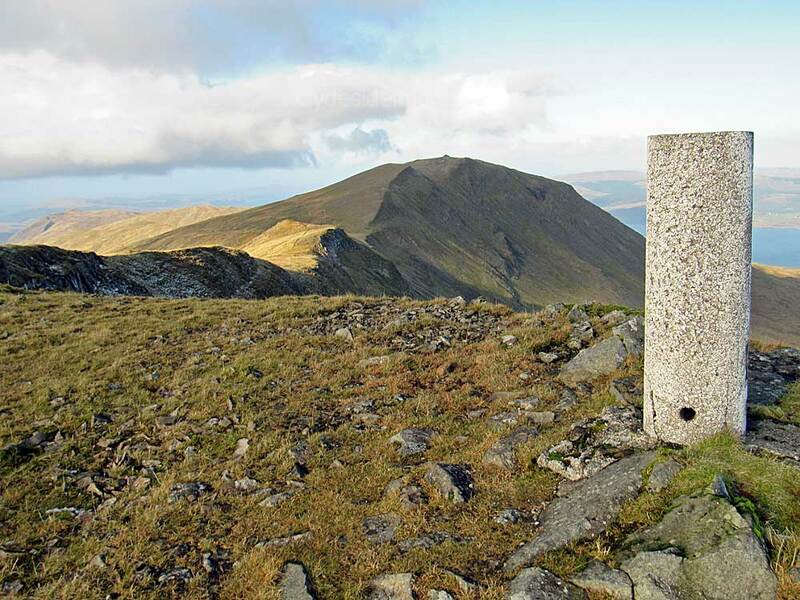 Although Ben More unsurprisingly receives far more attention by hillwalkers due to it’s status as the island’s only Munro, and the fact that it’s also Scotland’s westernmost 3,000 footer, the summit of Dun da Ghaoithe, in my opinion, is a far better viewpoint. 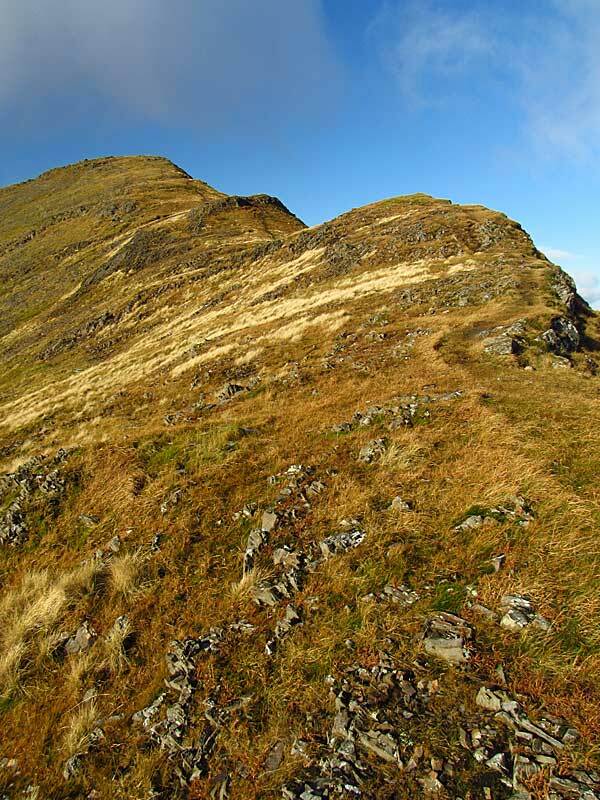 An ascent is also far more enjoyable as Ben More via the standard approach is a relentless slog from a sea level start, although a more interesting (and exposed) way to the top is via the the A’ Chioch ridge but I’ve yet to check it out. Dun da Ghaoithe from the south near Lochdon. 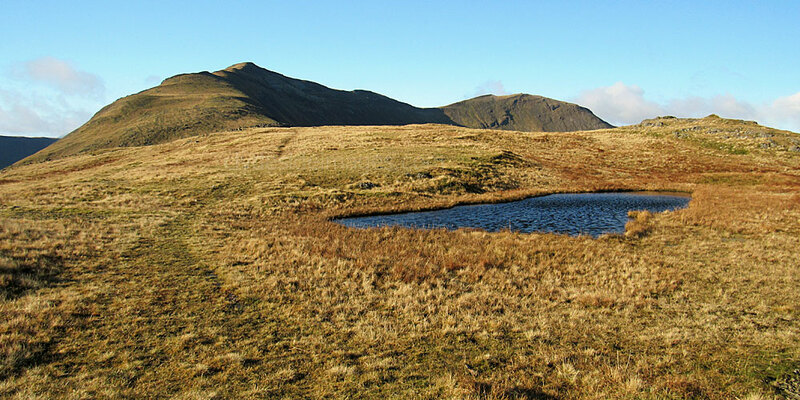 The mountain`s long ridge slants right from the main summit in the centre of this shot. 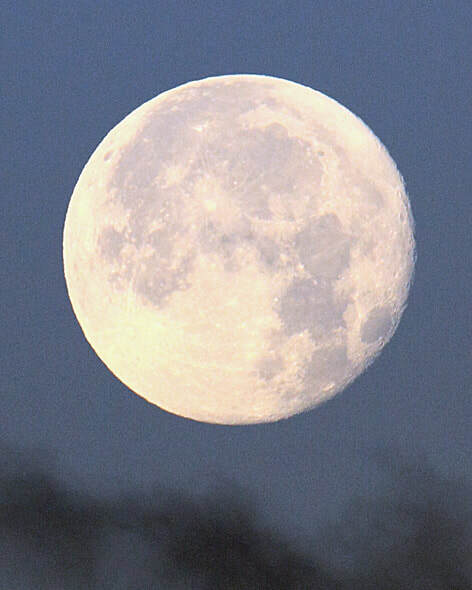 ​The moon was in its full moon phase and was still clearly visible, low down, directly in front of our rental cottage at Bunessan until well after first light. 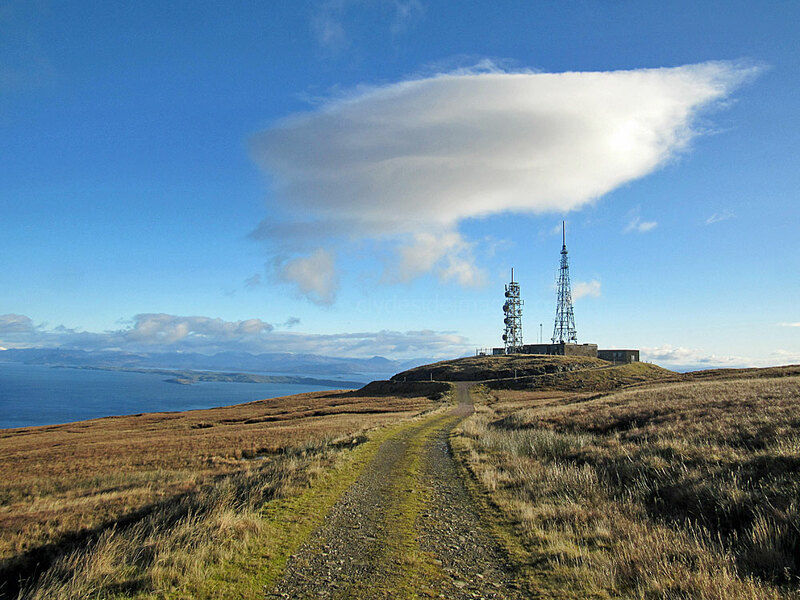 Sunday was set to be the best day during a short break on the island so I took the opportunity to climb Dun da Ghaoithe, a hill I’d intended to do for ages. 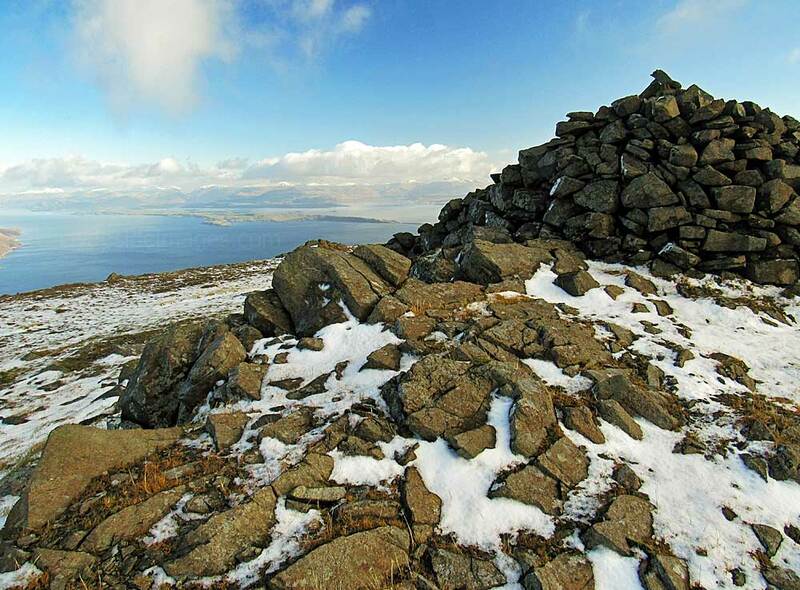 At 766 m (2513 ft), Dun da Ghaoithe is Mull’s only Corbett and the second highest hill on the island. It forms a dramatic backdrop to Duart Castle for ferry goers but as of my latest visit in November 2017, don’t expect any calendar style shots anytime soon - the structure is covered in scaffolding due to ongoing restoration work. 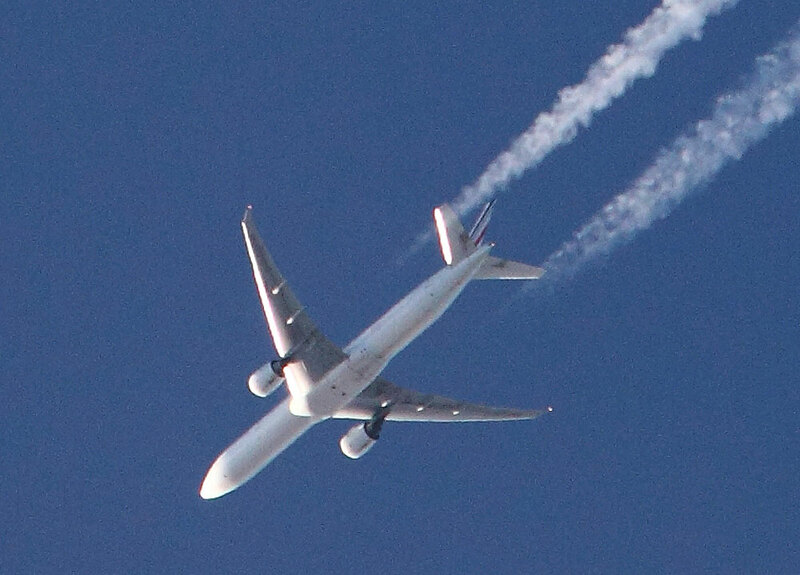 As I was loading up the car this airliner which I think belongs to Air France flew over at an altitude of around 39,000 ft but I was too slow in reaching my camera to catch it directly above. 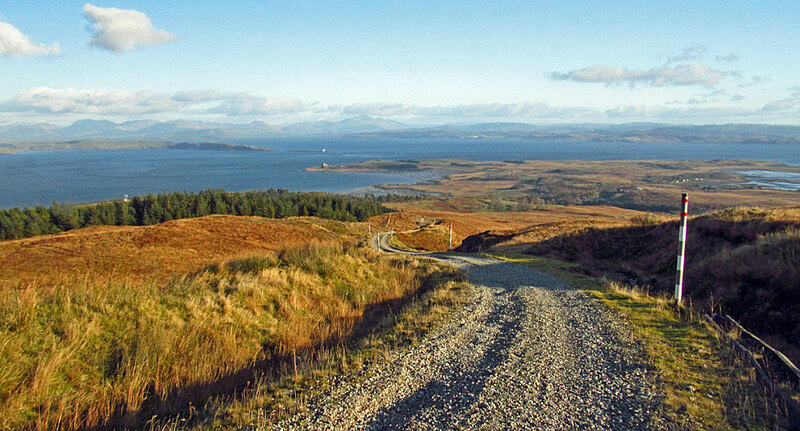 It took far longer to drive to the start near Craignure, the island’s main ferry terminal, from our rental accommodation at Bunessan than anticipated due to a series of wildlife encounters. Firstly, three buzzards were taking advantage of the bright and breezy conditions but remained too far off for a decent photo. A couple of miles further on I saw what was obviously a seal haul-out on an islet in Loch Scridain near the Pennyghael Timber Pier. There hadn’t been any activity here when driving past the previous afternoon as it was high-tide time but twenty-plus adults were ‘chilling’ in the morning sunshine. Within seconds one of several swimming pups leapt right out of the water ‘porpoise style’. I sat for here for around twenty minutes watching as other pups joined in, apparently showing off to their mums and dads. Both grey and common seals frequent Mull’s rocky coastline. Apart from the mating season (September - December), the greys spend most their time at sea, so the smaller, rounder common seals are those usually seen during the summer months. The species are of similar size and colour so it’s often difficult to distinguish between the two. ​The best method is when viewed head-on, the nostrils of the common seal form a distinctive ‘V’ shape and the head is round and small, whereas the greys have larger heads with rolls of flesh at the neck, ‘W’ shaped nostrils at the end of their prominent noses. If you hear any barking, hissing or other grumpy sounds, it will be a grey as common seals are normally quiet, placid creatures. 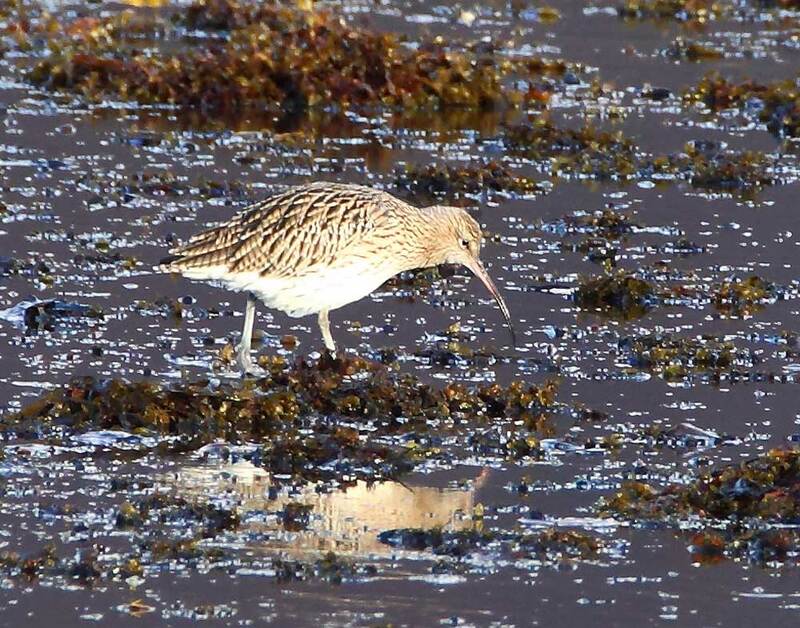 Further on I snapped what I think is a juvenile Curlew on the Loch Beg flats beside the Pennyghael village Post Office. 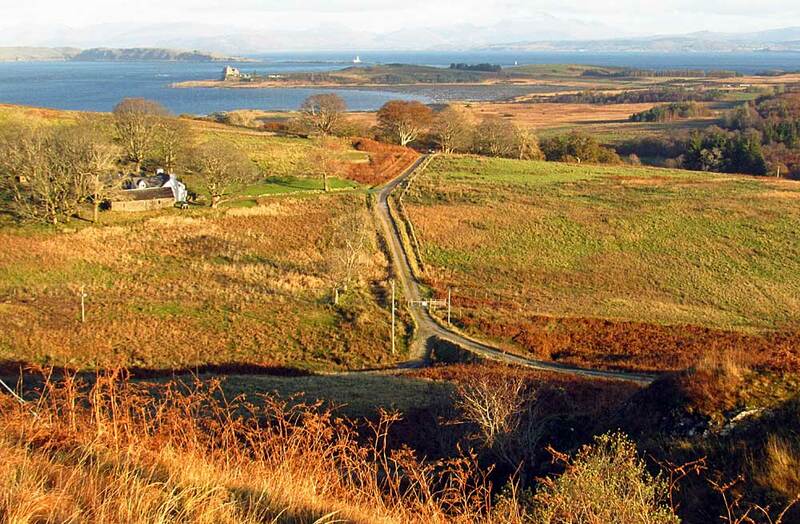 Loch Beg (below) is actually an eastern extension of Loch Scridain and its shallow waters make it a popular feeding ground for gulls and waders who also roost there. 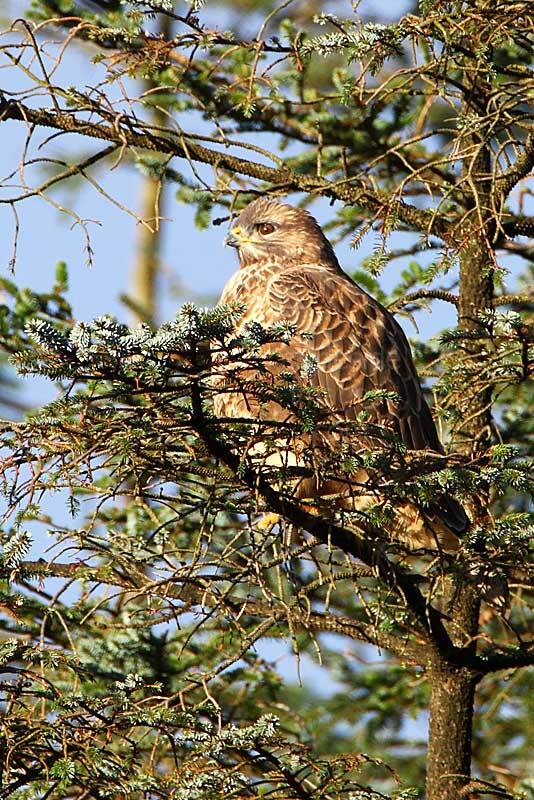 The Buzzard was resting, apparently after a large breakfast, in a conifer plantation near Ishriff. 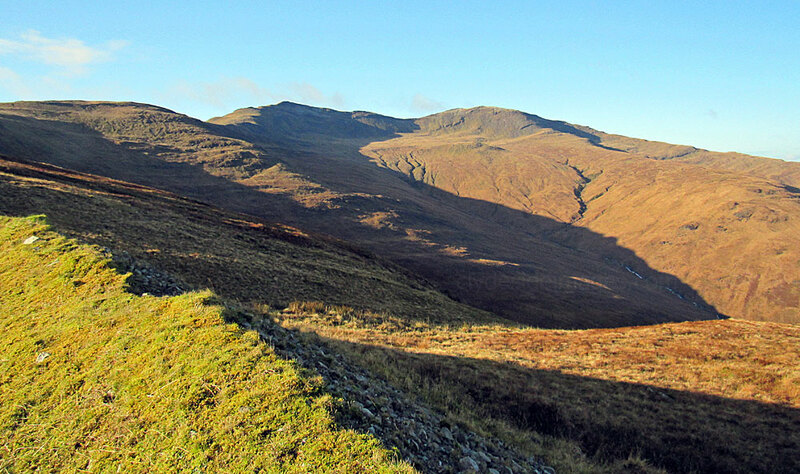 ​The traditional route to the summit of Dun da Ghaoithe begins at Upper Achnacroish (above), a farm which is reached via a tarred access lane on the east side of the A849, south of Craignure, between the entrance to Torosay Castle (Private) and the unclassified road to Duart Castle. 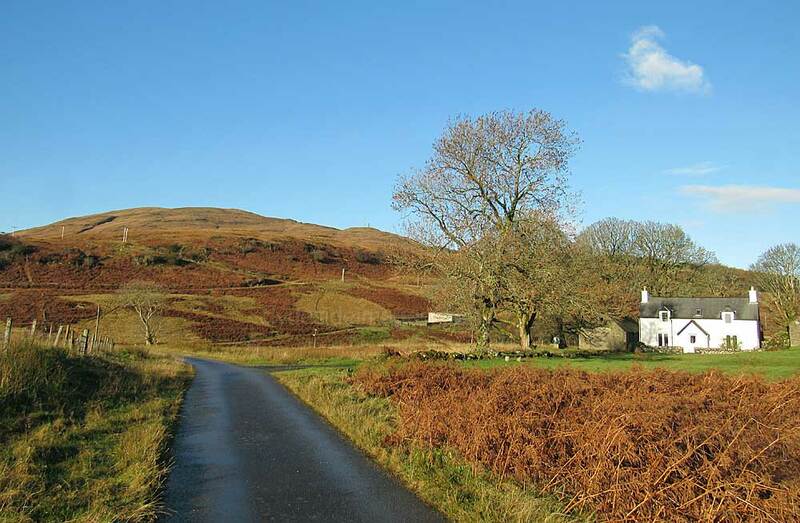 At Upper Achancroish there’s just enough rooms to park a few cars on a nearby verge and from there a service track to a couple of radio mast installations leads uphill. 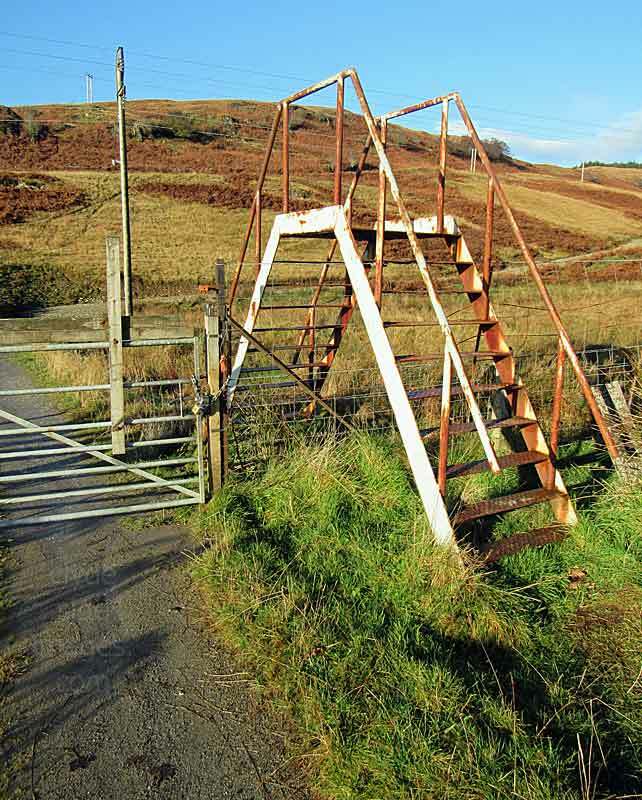 Above: Looking back to the start after walking for a few minutes: Upper Achnacroish is on the left with the sign, gate and metal style towards the centre foreground. My car is parked under the trees beside the road`s high point. 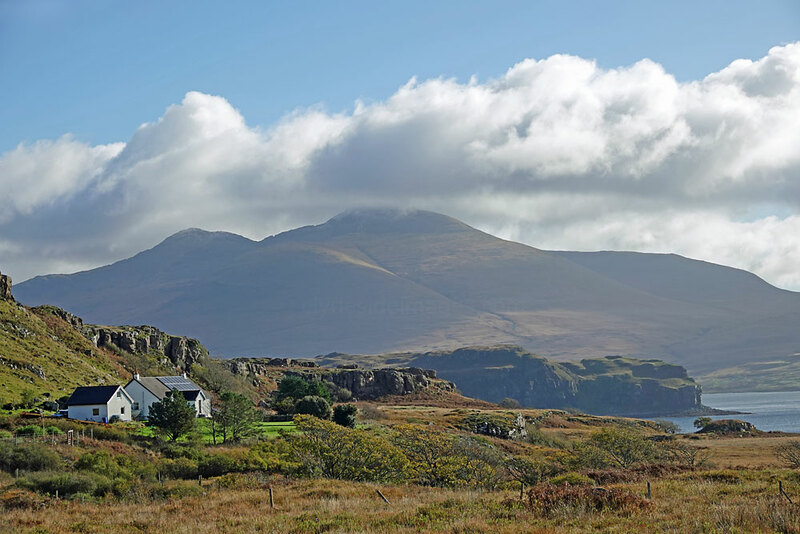 ​Unlike Ben More, the views open up early on, with Duart Castle, the islands of Lismore, Luing and Scarba, and the high peaks of the western seaboard visible in the distance. 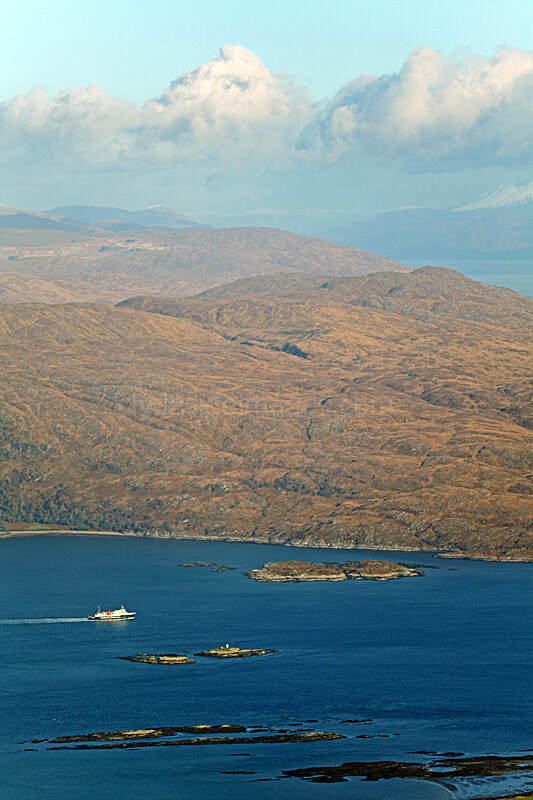 CalMac ferries on the Oban-Mull or Oban-Coll and Tiree routes emphasise the scale of the superb panorama. The track passes to the right of the first set of masts with their ancillary buildings and this is where you get your first view of the target peak (visibility permitting of course). 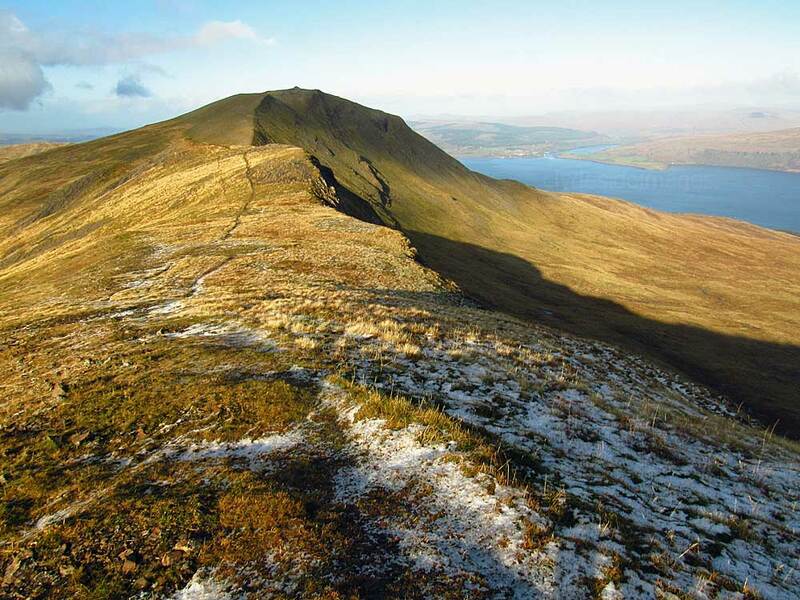 Two bumps can be seen in the view below and the summit of Dun da Ghaoithe, although it looks slightly lower, is the one on the right. The continuation to the second fenced communication complex includes a short but fairly steep series of zig-zags before the gradient eases. 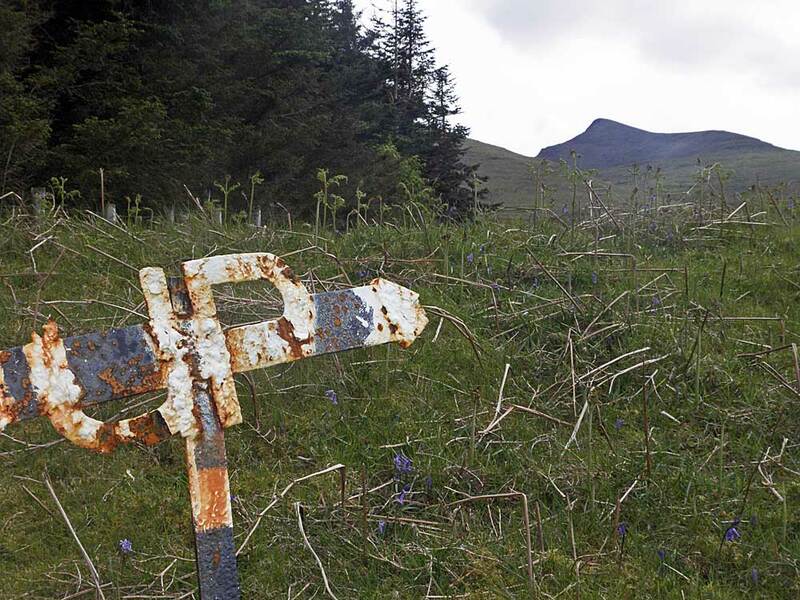 The track ends here and walkers must take to the open hillside. 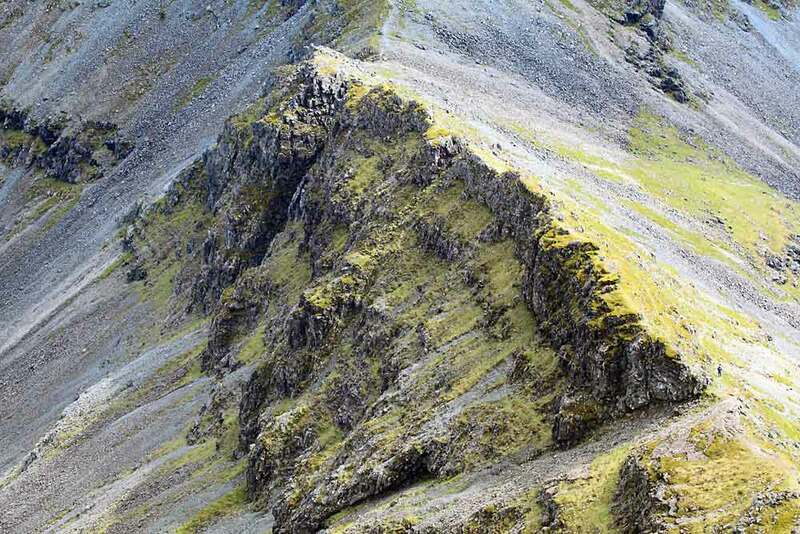 The going is pleasant and fairly easy-angled, on short grass for the most part, but just below the summit of Mainnir nam Fiadh, the ridge steepens and narrows considerably, a pleasant surprise, with the ground falling away dramatically on either side. 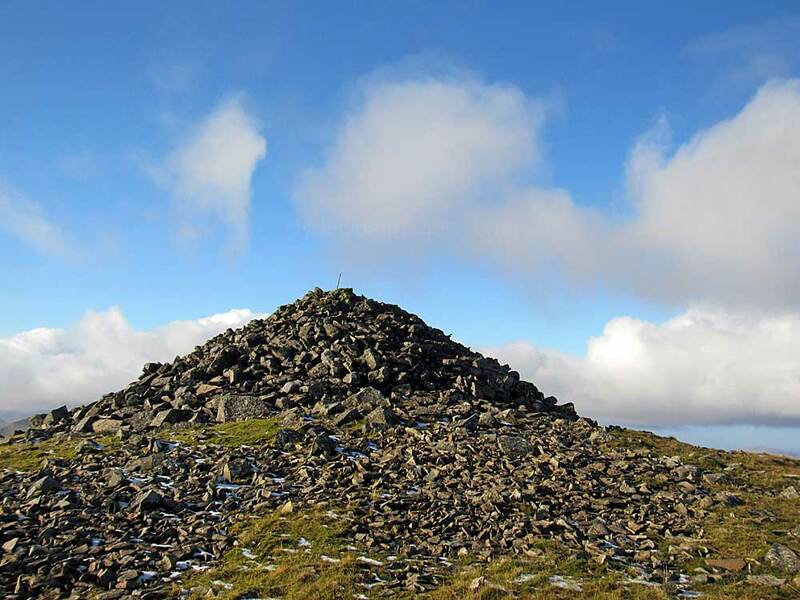 The white trig pillar is situated a few hundred metres away, on the edge of the corrie rim, just short of the actual high point which is marked by an enormous cairn. Dun da Ghaoithe lies 1km away to the NNW and is reached without a great deal of further effort. The cairn here (below) is almost as big as the one passed earlier. 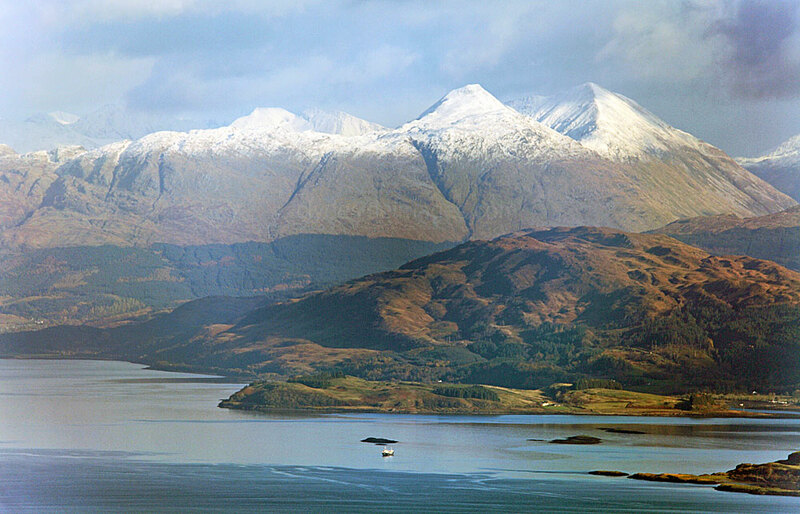 Ben Nevis, the Mamores, Glen Coe and Ben Cruachan & Co had what looked like a decent amount of snow on their upper reaches and there was even a dusting at the top of Dun da Ghaoithe. 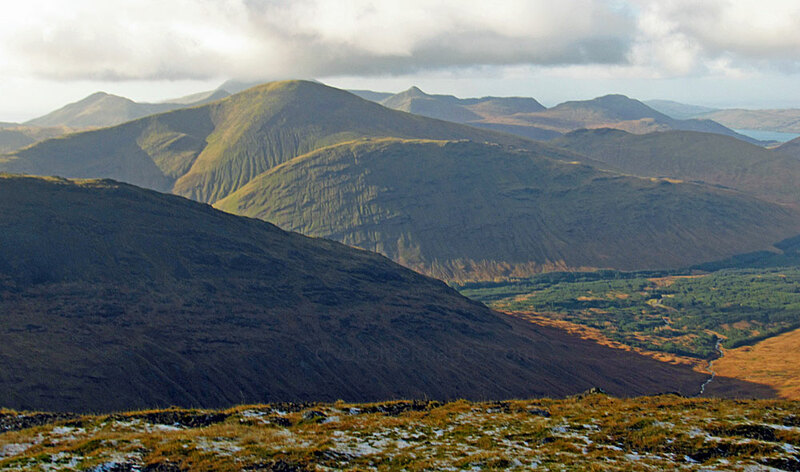 A telephoto view of the western Mamores taken from the summit is shown below right. 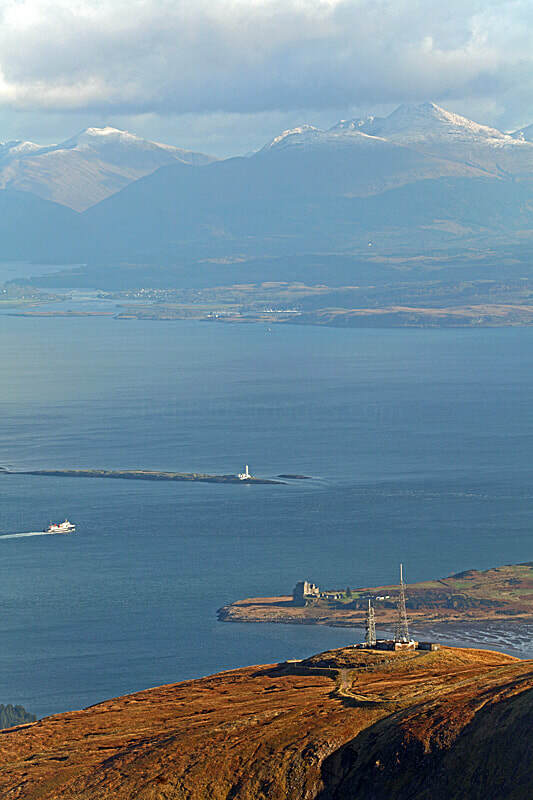 A cargo ship waiting to dock at the Glensanda `super quarry` has dropped anchor in Loch Linnhe and gives an idea of scale. 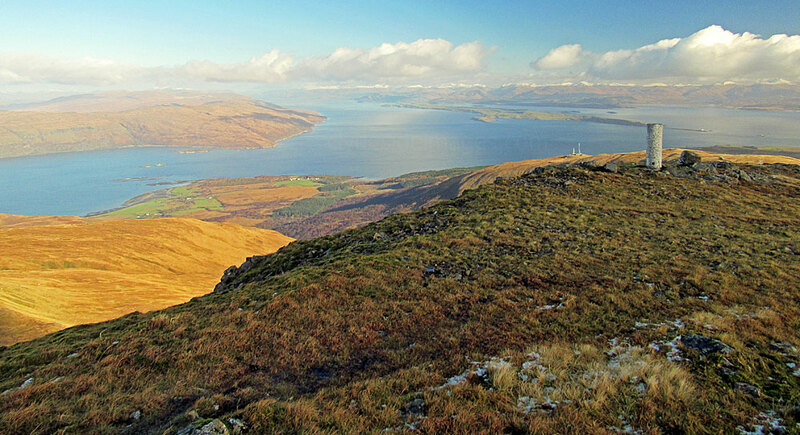 There are a couple of alternative descents from the summit of Dun da Ghaoithe ​if you have transport arranged, or fancy a long trek, but the best option is to retrace your steps and admire the same views on the way back. The only birds spotted during the walk were a couple of Ravens near the summit and a few Chaffinch and Meadow Pipit close to the farm on the way down. The small birds had taken flight when they saw a Buzzard on the hunt. 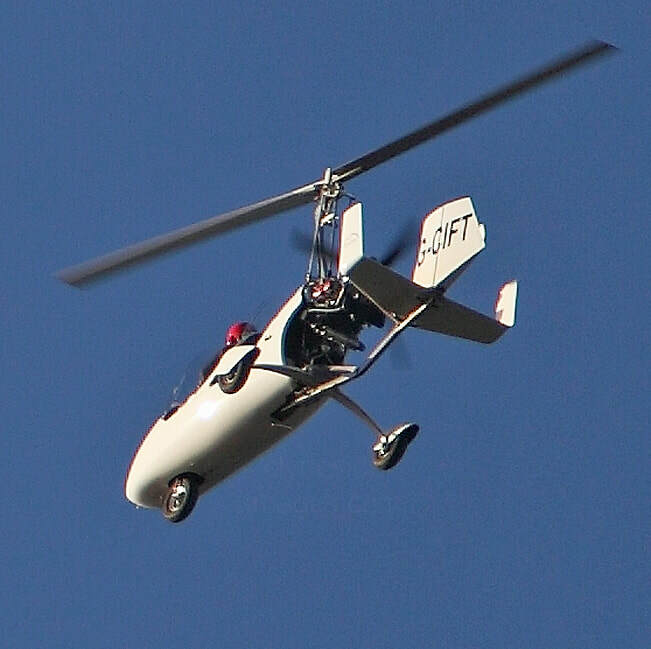 ​Still on the ‘flying front’, an all-white AutoGyro Europe MTO Sport registration G-CIFT appeared overhead as I reached the car at the end of the walk. 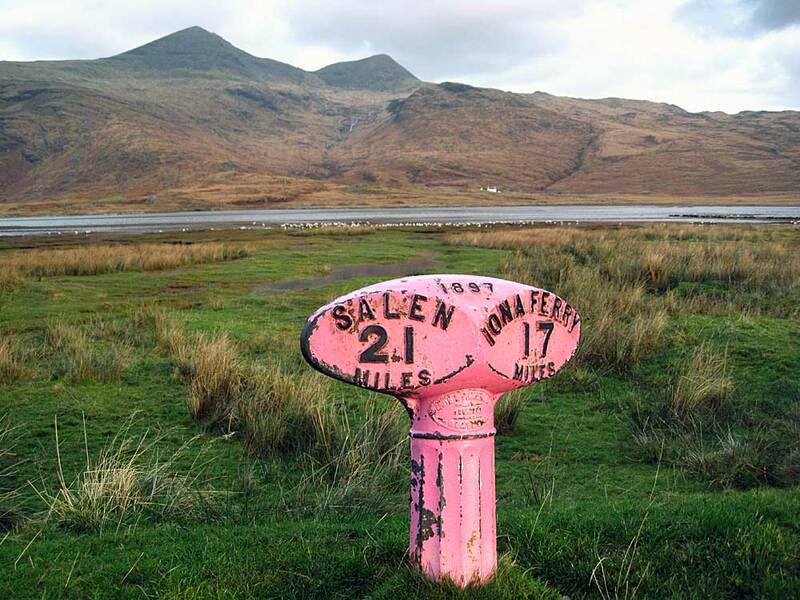 It may be based at Oban Airport on the mainland which is only 10-15 minutes flying time away, but it was probably operating from the small airfield at Glen Forsa which is the only one on the island. The 730 metre-long grass airstrip, which is operated by the adjacent Glenforsa Hotel, can only handle light aircraft and is a popular destination with private pilots.